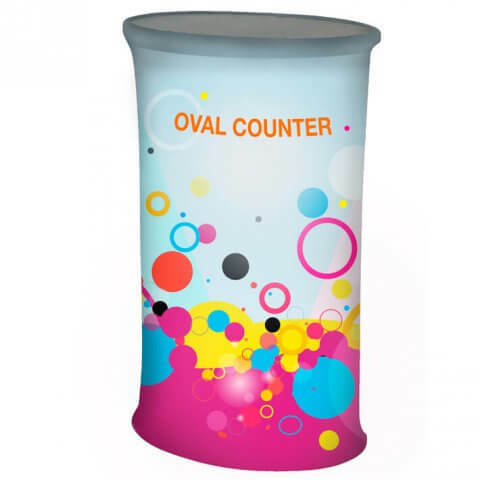 The Oval fabric counter is striking and unique. 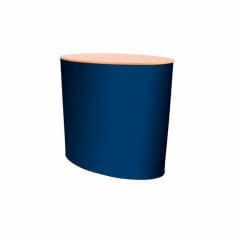 Part of the Formulate range, this oval counter has a base and top supported by three poles. A tensioned fabric sock is attached using silicone edged material. The counters are quick and simple to assemble. Vibrant dye sublimation print create stunning graphics. It is also fully washable. This is an ideal counter to greet guests. Exciting but practical. 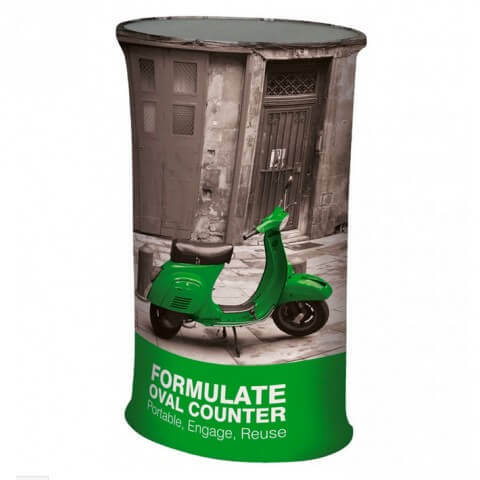 The Formulate range of display systems use an innovative one-piece fabric graphic panel to cover a lightweight yet sturdy tubular aluminium frame. Assembly of the display stand is very easy. Simply push the tubular sections of the frame together to lock them in place. Once the frame has been constructed, stand it up and the printed fabric graphic can be slid-over the frame like a sock and zip-closed. 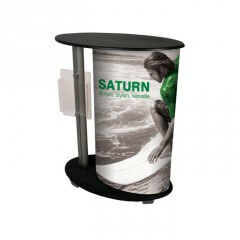 Prints for the Formulate range of displays are output on slightly elastic fabric. The stretch in the print helps keep the skin of the stand tensioned once fitted. The Formulate graphic contains no panel joins. In addition the overall weight of the display is less that a traditional counter. £215.00 need help? contact us! 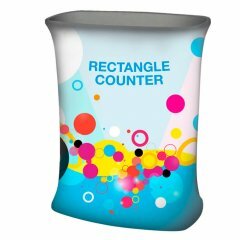 Rectangular counters in 2 sizes. Light, tough, striking. £328.95 need help? contact us! 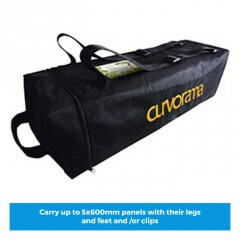 £359.00 need help? contact us!